The Board generally meets monthly on the second Monday of each month, as necessary and with the establishment of a quorum. Board meeting notices are posted at least 24 hours in advance on this webpage. The agenda and related materials for a particular meeting may be accessed by clicking on “Notice, Agenda, and Materials” underneath the meeting date. If you have trouble opening the meeting materials from your browser, right click on the applicable link, select either "Save link as" or "Download linked file as", save the document, and then open the saved document. Board meeting notices are also posted in the reception area of the Board's office, which is located in Phoenix at 1616 W. Adams Street, Suite 170. A summary of the meeting motions, as well as a recording of the meeting, are available for meetings occurring since January 2011 and will be available within three business days of the completion of any future meeting. To access the summary of a meeting, click on the “Meeting Summary” for the applicable meeting date. To access a recording for a particular agenda item from a specific meeting, click on “Notice, Agenda, and Materials” for the applicable meeting date and then select “play” for the item of interest. Meeting minutes for meetings held prior to January 2011 may be accessed by clicking on the “Approved Minutes” for the applicable meeting date. building. Available parking in the garage located on 15th Avenue, south of Jefferson Street. F. Arizona Alternative Education Consortium - Presentation on Student Choice and Alternative Education by Chris Barnes, Superintendent of Student Choice High School, Jessica Solis and Carlton Simmons, Graduates and Tonya Bridges-Brown, Director. I. Call to the Public This is the time for the public to comment. Members of the Board may not discuss items that are not specifically identified on the agenda. Therefore, pursuant to A.R.S. § 38-431.01(H), action taken as a result of public comment will be limited to directing staff to study the matter, responding to any criticism, or scheduling the matter for further consideration and decision at a later date. J. Consent Agenda - All items on this agenda will be considered by a single motion with no discussion, unless requested otherwise by a board member. L. *Compliance Matters - The Board will receive information to determine whether evidence exists that Vision Charter School, Inc. is in breach of one or more provisions of its charter contract, federal, state, or local laws regarding its failure to meet the operational performance expectations set forth in the Board’s operational framework. If the Board determines that a breach may have occurred, the Board may take action as it deems appropriate or necessary under state law, which may include issuing a notice of intent to revoke the charter pursuant to A.R.S. § 15-183(I). M. Summary of Current Events, Future Meeting Dates and Items for Future Agendas - The executive director, presiding officer or a member of the Board may present a brief summary of current events pursuant to A.R.S. § 38-431.02(K) and may discuss future meeting dates and direct staff to place matters on a future agenda. The Board will not discuss or take action on any current event summary. Call to the Public This is the time for the public to comment. Members of the Board may not discuss items that are not specifically identified on the agenda. Therefore, pursuant to A.R.S. § 38-431.01(H), action taken as a result of public comment will be limited to directing staff to study the matter, responding to any criticism, or scheduling the matter for further consideration and decision at a later date. *Consent Agenda - All items on this agenda will be considered by a single motion with no discussion, unless requested otherwise by a board member. School-Specific Academic Goals – Discussion, possible action and the second opportunity for public comment on revisions to the eligibility criteria for petitioning school-specific academic goals for inclusion in the Board’s Academic Performance Framework and Guidance. New Charter Application for 2020-2021 - Discussion and consideration of modifications to the New Charter Application for the 2020-2021 application cycle. Compliance Matters - Discussion and possible action. The Board will receive information to determine whether evidence exists that PLC Arts Academy at Scottsdale, Inc. continues to breach one or more provisions of its charter contract and state law regarding failure to timely submit the fiscal year ending June 30, 2018 annual financial audit in accordance with A.R.S. § 15-183(E)(6). If the Board determines that a breach remains, the Board may take action as it deems appropriate or necessary under state law, which may include issuing a notice of intent to revoke the charter pursuant to A.R.S. § 15-183(I). *School Specific Academic Goals - Discussion and possible action on the proposed school-specific academic goals to be used for the evaluation of Arizona Autism Charter Schools, Inc. for FY 2018 and FY 2019. Summary of Current Events, Future Meeting Dates and Items for Future Agendas - The executive director, presiding officer or a member of the Board may present a brief summary of current events pursuant to A.R.S. § 38-431.02(K) and may discuss future meeting dates and direct staff to place matters on a future agenda. The Board will not discuss or take action on any current event summary. Arizona Trans Youth and Parent Organization (AZTYPO) and Gay, Lesbian, and Straight Education Network (GLSEN) Organizations - Presentation on LGBTQ Inclusive School Policies & Practices by Robert Chevaleau, Director of AZTYPO and Madelaine Adelman, Chapter Founder/Board Member of GLSEN. Executive Director Position – Discussion and possible action on the selection of the new Executive Director. Pursuant to A.R.S. § 38-431.03(A)(1), the Board may vote to go into Executive Session, which will not be open to the public, for discussion or consideration of employment and personnel matters for this agenda item. Charter Renewal – Discussion and possible action on the Renewal Application Package for Pillar Charter School. *Compliance Matters - Discussion and possible action. The Board will receive information to determine whether evidence exists that Vision Charter School, Inc. is in breach of one or more provisions of their charter contract, federal, state, or local laws regarding their failure to appropriately amend the instructional days on file in its contract, comply with A.R.S. § 38-431.02(A)(1), and bring its enrollment packet into compliance. If the Board determines that a breach may have occurred, the Board may take action as it deems appropriate or necessary under state law, which may include withholding of up to 10% of the monthly apportionment of state aid and requiring a corrective action plan pursuant to A.R.S. § 15-185(H). The Board will receive information to determine whether evidence exists that Arizona Academy of Science & Technology is in breach of one or more provisions of their charter contract, federal, state, or local laws regarding their failure to submit required documentation to address issues identified during a site visit; including a copy of the method used to inform parents and guardians of the availability of school employees’ educational and teaching background and experience pursuant to A.R.S. § 15-183(F), a copy of the school’s policies and procedures regarding appropriate fingerprinting checks, submission of lesson plans to review its program of instruction, and proof of a school inspection related to a school health incident at Arizona Academy of Science & Technology school. Update on schools with an “F” Letter Grade - Discussion and possible action on the signing of consent agreements for charter holders that operate charter schools that have been assigned a FY 2018 letter grade of “F”. The Board will receive information regarding which schools have signed consent agreements and which have complied with the provisions of the consent agreement. Available parking in the garage. Discussion and consideration relating to the interview and selection of the final candidates for recommendation to the Arizona State Board for Charter Schools for the position of Executive Director. Pursuant to A.R.S. § 38-431.03(A)(1), the Subcommittee may vote to go into Executive Session, which will not be open to the public, for discussion and consideration of employment matters for this item. Discussion and action on next steps in the Executive Director selection process. Pursuant to A.R.S. § 38-431.03(A)(1), the Subcommittee may vote to go into Executive Session, which will not be open to the public, for discussion and consideration of employment matters for this item. The Board's meeting room is located in the State Land Department building. and in the visitor parking on the northwest corner of 16th Avenue and Monroe. Discussion and review of interview questions for consideration of position of Executive Director- Pursuant to A.R.S. § 38-431.03(A)(1), the Subcommittee may vote to convene in executive session, which will not be open to the public, for discussion and consideration of employment matters for this item. Discussion and review of resumes and identification of candidates to be interviewed- Pursuant to A.R.S. § 38-431.03(A)(1), the Subcommittee may vote to convene in executive session, which will not be open to the public, for discussion and consideration of employment matters for this item. Discussion and action on next steps in the selection process- Pursuant to A.R.S. § 38-431.03(A)(1), the Subcommittee may vote to convene in executive session, which will not be open to the public, for discussion and consideration of employment matters for this item. The meeting will begin on December 10, 2018 and resume on December 11, 2018 if there are additional agenda items requiring consideration and action. Call to the Public - This is the time for the public to comment. Members of the Board may not discuss items that are not specifically identified on the agenda. Therefore, pursuant to A.R.S. § 38-431.01(H), action taken as a result of public comment will be limited to directing staff to study the matter, responding to any criticism, or scheduling the matter for further consideration and decision at a later date. Consent Agenda - All items on this agenda will be considered by a single motion with no discussion, unless requested otherwise by a board member. Consideration to approve a change in legal status for LEAD Charter Schools dba Leading Edge Academy Queen Creek. Financial Performance Framework - Presentation, discussion and possible action on moving forward with administrative rulemaking for implementing the financial performance framework proposed by the Board’s Financial Framework Subcommittee. Transparency Recommendations - Presentation, discussion and possible action on recommendations to promote transparency. Compliance Matters - The Board will receive information to determine whether evidence exists that the charter holders listed below are in breach of one or more provisions of their charter contract, federal, state, or local laws regarding their failure to meet the timeframes established for the timely submission of the annual financial audit in accordance with A.R.S. § 15-183(E)(6). If the Board determines that a breach may have occurred, the Board may take action as it deems appropriate or necessary under state law, which may include withholding up to 10% of the monthly apportionment of state aid and requiring a corrective action plan pursuant to A.R.S. § 15-185(H). Center for Creative Education, Inc.
PLC Arts Academy at Scottsdale, Inc.
New Charter School Applications - Discussion and possible action on the following application packages and requests for a charter. Educational Models for Learning, Inc.
B. 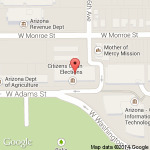 Discussion and possible action on recommendations to promote transparency that have been updated based on additional public comment and on a recommendation to the Arizona State Board for Charter Schools on the adoption of financial performance eligibility criteria for expansion requests based on the Board’s Financial Performance Framework. C. Opportunity for Public Comment: This is the time for the public to comment and discuss with the Subcommittee suggested recommendations to the Board’s Financial Performance Framework and Dashboard and transparency recommendations. D. Summary of Current Events, Future Meeting Dates and Items for Future Agendas - The executive director, presiding officer or a member of the Subcommittee may present a brief summary of current events pursuant to A.R.S. § 38-431.02(K) and may discuss future meeting dates and direct staff to place matters on a future agenda. The Subcommittee will not discuss or take action on any current event summary. Consideration to approve an enrollment cap increase for Academy of Mathematics and Science, Inc. (79961), a charter holder that has met the staff recommendation criteria. Charter Amendment - Discussion and possible action on the charter representative and two charter holder governance amendment requests from PLC Arts Academy at Scottsdale, Inc.
Schools with an “F” Letter Grade - Discussion and possible action on proposed revisions to the Consent Agreement used in the procedural steps for restoring or revoking charters that operate charter schools that have been assigned an FY 2018 letter grade of “F” by the Arizona Department of Education. The Board will receive information to determine whether evidence exists that Desert Springs Academy, Inc. is in breach of one or more provisions of their charter contract, federal, state, or local laws regarding their failure to appropriately request approval from the Board to amend its charter to make changes to its corporate board. The Board will receive information to determine whether evidence exists that the charter holders listed below are in breach of one or more provisions of their charter contract, federal, state, or local laws regarding their failure to timely submit the annual financial report in accordance with A.R.S. § 15-183(E)(6). B. Discussion and possible action on the average daily membership (ADM) measure and on recommendations to the Arizona State Board for Charter Schools on the adoption of measures and measure targets discussed previously by the Subcommittee for inclusion in the Board’s Financial Performance Framework. C. Discussion and possible action on recommendations to the Arizona State Board for Charter Schools on the adoption of the summative performance ratings (formerly referred to as summative performance levels) discussed previously by the Subcommittee for inclusion in the Board’s Financial Performance Framework. D. Discussion and possible action on interventions and financial performance expectations and on recommendations to the Arizona State Board for Charter Schools on the adoption of interventions and financial performance expectations for inclusion in the Board’s Financial Performance Framework. E. Discussion and possible action on recommendations to the Arizona State Board for Charter Schools on other considerations to promote transparency. F. Opportunity for Public Comment: This is the time for the public to comment and discuss with the Subcommittee suggested recommendations to the Board’s Financial Performance Framework and Dashboard. G. Summary of Current Events, Future Meeting Dates and Items for Future Agendas - The executive director, presiding officer or a member of the Subcommittee may present a brief summary of current events pursuant to A.R.S. § 38-431.02(K) and may discuss future meeting dates and direct staff to place matters on a future agenda. The Subcommittee will not discuss or take action on any current event summary. Arizona Alternative Education Consortium – Presentation on Online/Blended Alternative Education by Tamara Becker, Assistant Superintendent at Edkey, Inc. Surrender Agreements - Discussion and possible action on the proposed Voluntary Surrender and Charter Termination Agreement for Paragon Preparatory Academy, Inc. Eligibility Criteria for Replication Charter and Charter Transfer Applications – Discussion, possible action and the second opportunity for public comment on the adoption of proposed revisions to the eligibility criteria.